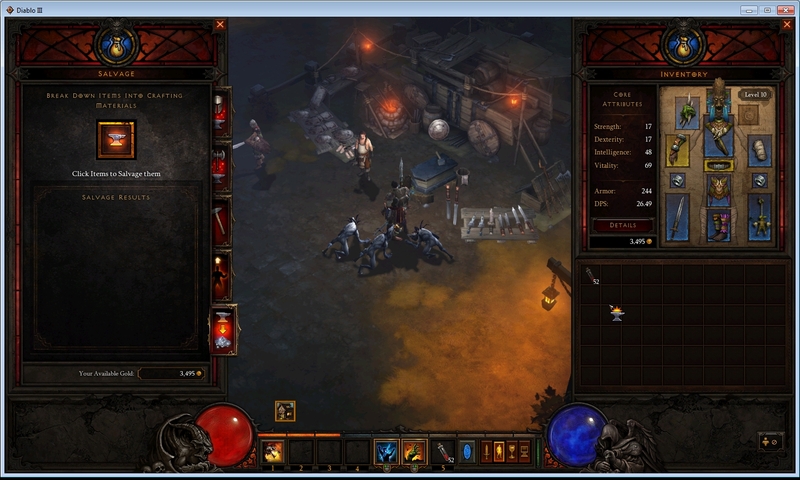 Intro to Diablo 3 – part 2 – Crafting! Alright! To continue on with my “Intro to Diablo 3” series, i’m going to spend this post talking about the crafting system. 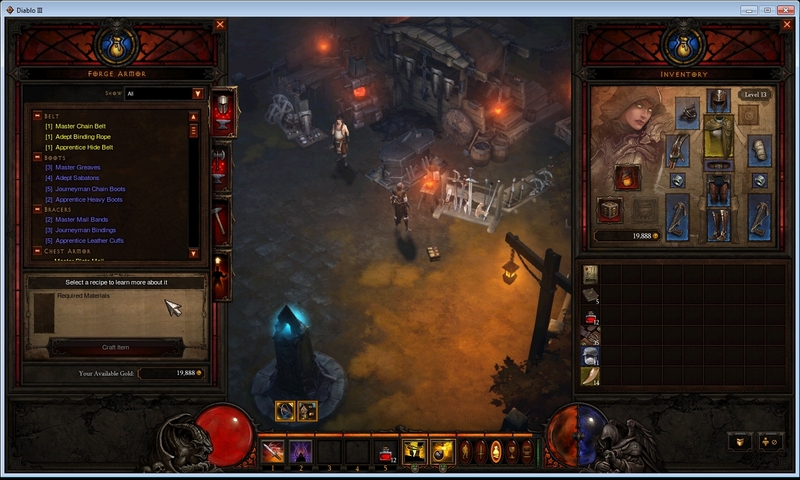 This first screenshot is of your “stash”. This is basically your account’s bank. Unlike the banks in WoW, it is not character specific. This will span across every character you have on your account. There are also no “Bags” in the game. 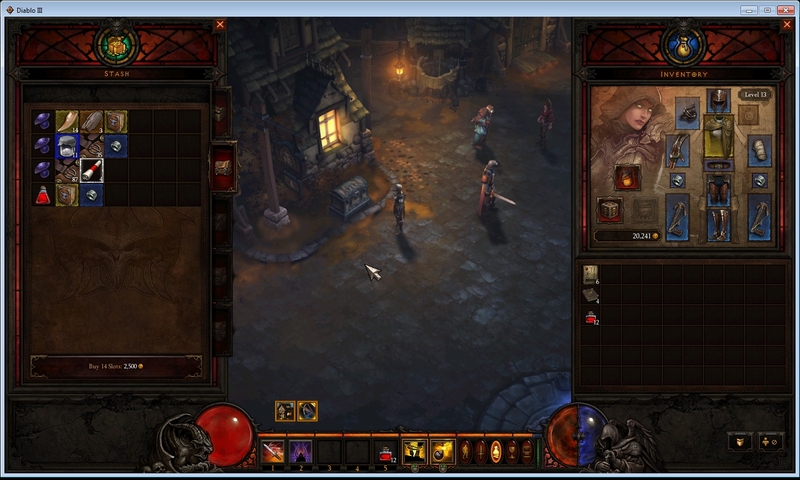 Instead, you buy pre-sized tabs (much more like a guild bank) with a certain number of slots (14) automatically given. There are 5 pages of slots of 5 14-box slots. Unlocking each one costs a bit of money (the first few are cheap, progressively getting more expensive as you open more pages). 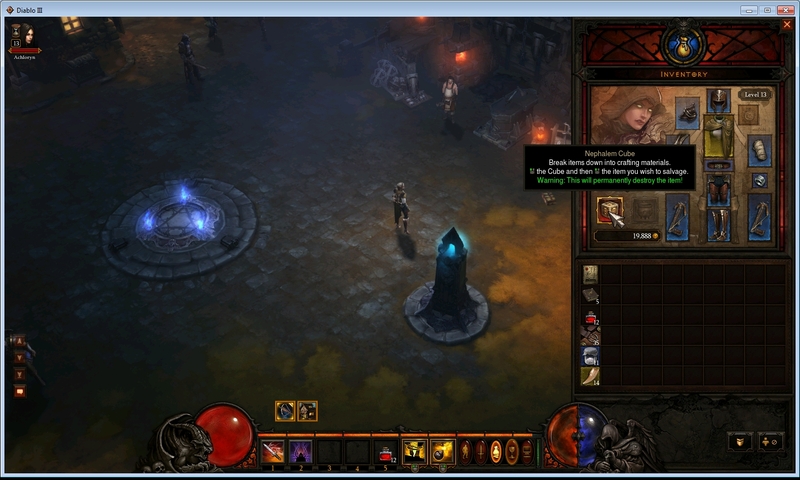 This screenshot is meant to point out the Nephalem Cube. This operates just like the “disenchant” ability from WoW. You click the cube, and then you click the item in your inventory or bank that you want to break down, and then crafting materials are automatically placed in your inventory. As you would imagine, the better items require higher end crafting items. UNlike disenchanting in wow, you can break down items of any quality (grey, white, blue, yellow, etc). Of course, disenchanting lower quality items gives you a higher chance of the “cheapo” crafting materials, and the higher quality items give you higher quality crafting materials. A “Tome of Training”, which is then something you give to your crafter, along with some basic crafting materials and a modicum of gold to upgrade them. In the two screenshots below, you will see the “Upgrade Crafter” screen, and the Crafting interface. When upgrading your crafter, you will see the recipes that he learns from the upgrade process. (For the record, my blacksmith is upgraded WAY beyond anything I can use in the beta. /sadface) When you upgrade the crafter, he “levels” up, giving him access to higher item level recipes. 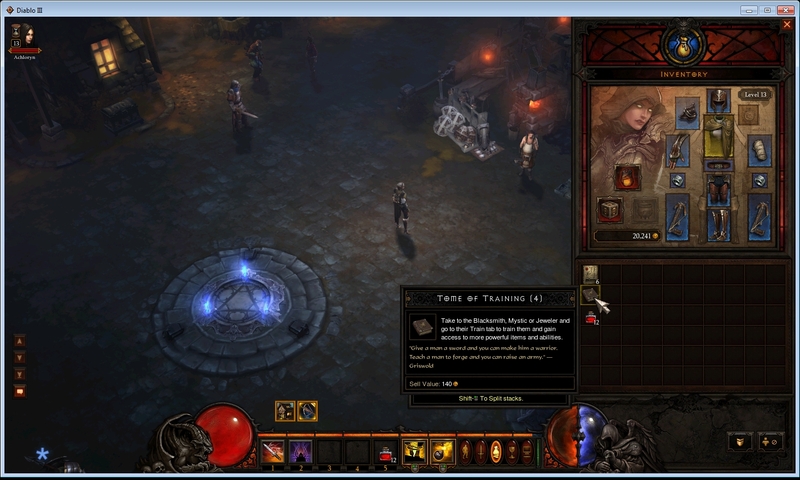 As you can see in the crafting interface, there are apprentice, journeyman, adept, and master “level” items, which equates to their item level. This particular NPC is the blacksmith, who creates weapons, armor, as well as repairs your gear. The crafting interface is very similar to what you’re familiar with from any crafting done in WoW. Click on a recipe in the list, and it will tell you what materials you need, as well as the gold cost associated (which also increases with the higher level of item to be created). Also, as you can see, the recipes also show you how many of that particular item you can create based on the materials currently in your bag… it doesn’t take into account any crafting materials in your stash. It is also worth noting that your crafters, just like your stash, are account-wide. When you upgrade your blacksmith on one toon, all of the new recipes are available for creating among each character. Also, along your travels, you can find crafting recipes, which you can simply give to the respective crafter (weapon/armor recipes to the blacksmith, etc). 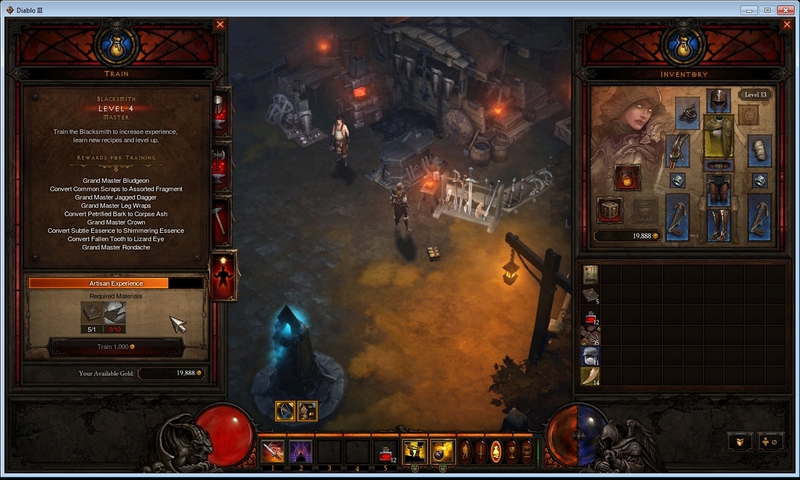 Crafting in Diablo 3 seems to be very simple, and if you’ve ever done any kind of crafting in WoW, then you’re already 4/5’s of the way to understanding this crafting system.